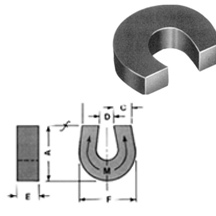 The SMHA0009 AlNiCo Horseshoe Magnet is made from high performance AlNiCo, with epoxy paint coating. The dimension of this item is 58mm × 35mm × 40.5mm. It can pull up to 50.71 lbs steel.